The art of knifemaking has no geographic boundaries. Makers practice their craft on every continent and in every country on the planet. In Cape Town, South Africa, there is Des Horn. Des, a practicing dentist, gained international acclaim as a knifemaker in the 1960s when his knives started selling in and out of Africa. His desire to make knives was first piqued after having communicated with knifemaking great Bo Randall of Randall Knives. While his early efforts were primarily fixed-blades, he later moved to making folding knives. A member of both the South African and Italian Knifemaker's Guilds his debut collaboration with Spyderco is the Des Horn Folder. The Des Horn Folder is best described in a single word, sleek. The blade intertwines elements of both a Spear-Point and a Wharncliffe shape and tapers to a super-fine, flat-ground, PlainEdged tip. 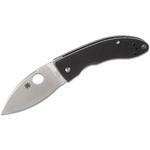 The blade is CPM S30V high-carbon and therefore highly edge-retentive, powdered steel manufactured by Crucible Inc. Corrugated furrows machined above the hole into the blade's steel artistically continue through to adjoining black G-10 handle adding a grip-able texture through stylish graphics. The handle tapers in a mirror image of the blade. Narrowing to a tip at the handle's back end the folder takes on a spike-like profile with a horizontal straight on the bottom of the knife running from the tip of the blade to the end of the handle. Inside is a Michael Walker Liner Lock, while outside the G-10 scales come assembled with an adjustable pivot and scale screws. A deep-pocket wire clip positions the folder for tip-down, right-hand carry. 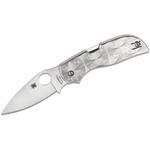 The folder combines Des Horn's signature look with Spyderco features and manufacturing quality. 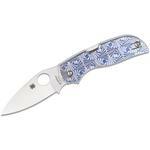 Hey, I wanted to share "Spyderco C153GP Des Horn Folding Knife 3-1/8 inch S30V Plain Blade, G10 Handles" with you from KnifeCenter.